• Interview on the Children's Book Podcast with Matthew Winner. Sweet Snow Pony is loved by all for her beautiful coat as white as snow and her mane as black as ebony. Children come to her farm from all over just to have her braid their hair and teach them line dancing. But not everyone loves Snow Pony. Jealous Queenie hatches an evil plan to make Snow Pony run away from the stable by planting a trail of apples into the woods and before long Snow Pony is lost! Full of delicious apples but all alone in the woods, Snow Pony stumbles upon the home of seven miniature ponies. 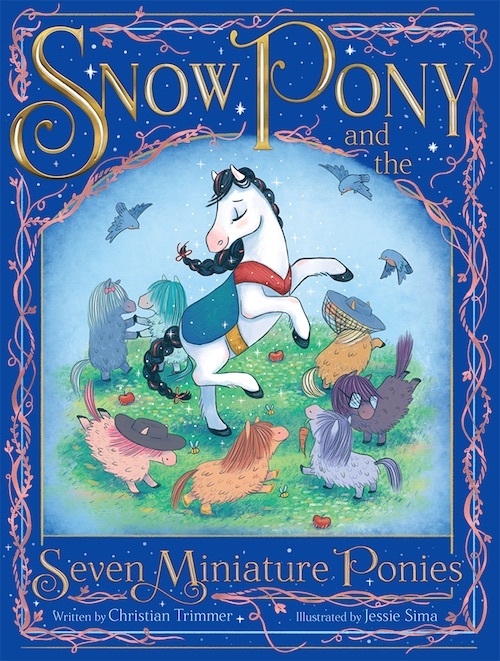 The mini-ponies couldn’t be cuter, especially with Snow Pony’s braids, but they don’t have quite the same moves as the kids back on the farm. Will her new friends help her find her way home? Or will the evil Queenie get her way? Available at your local bookstore and online!